Jaundice is the yellow colouring of skin and sclera caused by the accumulation of bilirubin in the skin and mucous membranes. Neonatal jaundice occurs in 60% of term infants and 80% of preterm infants  and is caused by hyperbilirubinaemia that is unconjugated (divided into physiological or pathological) or conjugated (always pathological). High levels of unconjugated bilirubin have acute harmful effects as well as long term damage if left untreated, such as kernicterus. 10% of breast fed babies are jaundiced at 1 month. Starts at day 2-3, peaks day 5 and usually resolved by day 10. The baby remains well and does not require any intervention beyond routine neonatal care. Physiological jaundice can progress to pathological jaundice if the baby is premature or there is increased red cell breakdown e.g. Extensive bruising or cephalohaematoma following instrumental delivery. Jaundice which requires treatment or further investigation. Colour: All babies should be checked for jaundice with the naked eye in bright, natural light (if possible). Examine the sclera, gums and blanche the skin. Do not rely on your visual inspection to estimate bilirubin levels, only to determine the presence or absence of jaundice. Infants that are not jaundice to the naked eye do not need routine bilirubin checking. Total and Conjugated Bilirubin is important if suspected; liver or biliary disorder, metabolic disorder, congenital infection or prolonged jaundice. Do not subtract conjugated from total to make management decisions for hyperbilirubinaemia. Infection screen if unwell or <24 hours including Microbiological cultures if infection suspected: blood, urine, CSF. Consider TORCH screen. Repeat bilirubin 4-6 hours post initiation to ensure not still rising, 6-12 hourly once level is stable or reducing. Do not give additional fluids with phototherapy unless indicated and if possible expressed maternal milk is preferred. If phototherapy intensified or feeding poorly consider NGT feeding or IV fluids. This is the simultaneous exchange of the baby’s blood (hyperbilirubinaemic) with donated blood or plasma (normal levels of bilirubin) to prevent further bilirubin increase and decrease circulating levels of bilirubin. 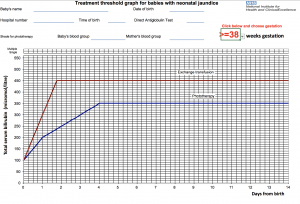 Performed via umbilical artery or vein and is indicated when there are clinical features and signs of acute bilirubin encephalopathy or the level/rate of rise (>8.5µmol/L/hour) of bilirubin indicates necessity based on threshold graphs. This will require admission to an intensive care bed. IVIG can be used as adjunct to intensified phototherapy in rhesus haemolytic disease or ABO haemolytic disease. Kernicterus, billirubin-induced brain dysfunction, can result from neonatal jaundice. Bilirubin is neurotoxic and at high levels can accumulate in the CNS gray matter causing irreversible neurological damage. Depending on level of exposure, effects can range from clinically undetectable damage to severe brain damage. Depends on underlying cause but if correctly and promptly treated prognosis is excellent. Always refer to local trust guidelines. The accumulation of what pigment causes jaundice? What percentage of breast fed babies have jaundice at 1 month? When would you measure U+Es? What system is mainly affected by Kernicterus? 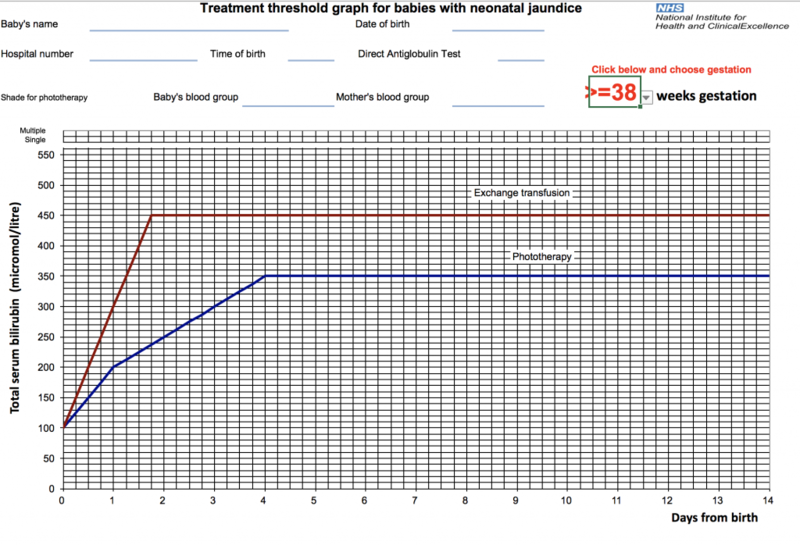 What percentage of term infants develop neonatal jaundice? Which of the following is most likely to be physiological jaundice? Which of the following is not a risk factor for pathological hyperbilirubinaemia? How long after stopping phototherapy should bilirubin levels be checked to rule out rebound hyperbilirubinaemia?